On a recent trip to the UK, I called in to a Lidl store because I know they often have interesting (well, to me anyway) bits of tech for low prices. I picked up this little gem for a shade over thirty quid. When you consider it contains wifi hardware, a web server, pan & tilt motors, speaker & microphone and of course a camera, then I think that is a fair price. The device also comes with a UK mains adaptor and a high quality Ethernet cable too, so it has everything you need to get started. The camera copes well with a range of lighting conditions. I’ve tested in bright sunlight, indoors with both fluorescent and tungsten lighting and all gave good quality images. One thing which really surprised me was the low light operation. The camera automatically switches to a ‘high gain’ mode when ambient light falls. I’m not sure if has a separate sensor for this but the results are impressive. You lose some of the colour details, with an essentially monochrome image but the camera is able to see better in low light than my own eyes can! The camera also has some infra-red LEDs fitted which it uses as a floodlight, so you can even see in total darkness. This works much better than I thought it would, with enough illumination to see clearly to about 6 metres from the camera. There is a down-loadable app for both iOS and Android devices which allows you to watch the stream from the camera, and control the pan & tilt motors easily. You can also receive a live audio stream, and the camera also has a speaker in it, allowing you to talk back too. There are terminals provided for interfacing with alarm systems, and you can control this output via the web interface too, so you could use it for whatever you liked. Feeding your pets remotely from your smart-phone, and then watching them eat maybe? The camera’s web server seems reasonably secure. Two levels of authentication are used. One to view, and one to configure. However, I should point out that the passwords are sent in the clear in URL requests which is a bit daft. Don’t use passwords anywhere else and be aware of browsers etc caching URL requests. The device also has a telnet port, which doesn’t respond to the login credentials used in the web browser, so I’m not sure who it’s for. It’s certainly not a good idea to expose this port to the wider internet! 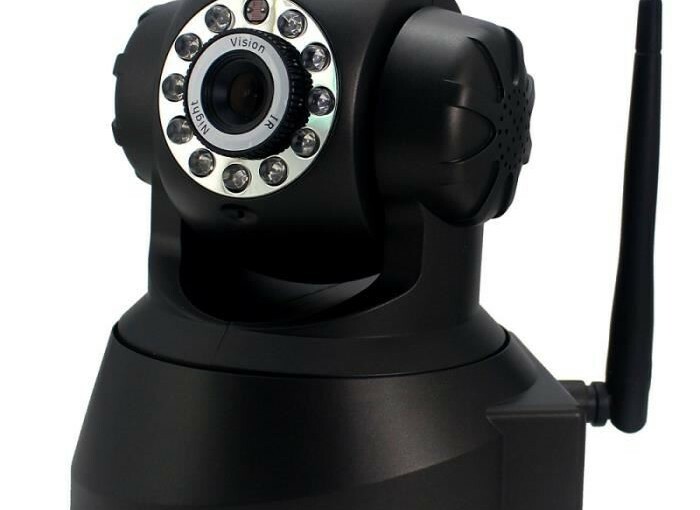 The software in the camera also does motion-detection and can trigger the alarm connector output on detection, send emails with pictures attached and upload images to an FTP server so it’s quite good for security use. Hi I’ve also bought the same camera. Can you tell me how to record automatically. I can record and take pictures by pressing the relevant modes on the screen.but the camera will not record automatically. I’m not sure that you can record automatically using the software apps. You might be able to record the stream directly to another computer on the same network as the camera, using some third party software but I haven’t tried this myself. Hopefully something will work for you! I have this camera too set up by my son. I am not a techie so am unsure how to access it remotely. Is this possible without further cost or do I need to buy some sort of package. I can monitor it on my iPad mini and my netbook while in the house but when abroad recently could not connect. Any help would be appreciated. 2. Find out your public IP address. This is probably visible in your router settings, or you can visit a site like http://myipaddress.com – This is the address you will use to connect to your camera from outside your home network. There’s a slight risk to the security of your network when you open ports in your router, so you might want to do some more reading about that. Do you know the URLs for this ipcam for streaming, jpeg and simple pzt movements? Hopefully you know the details of [ipaddress of camera], [username], [password] for your particular camera! I can’t see a way to record automatically using the camera’s web interface, but you can do it with the IUK Viewer (google it to download). I’m using IUK Viewer V2.9. Once you’ve connected to the camera, the System Settings allows you to specify folders for snapshots and videos, duration of recording etc. Then, double-click on the camera (in “Camera List”) to access the camera settings – lots of them. Under ‘Alarm Settings’ there are options to set up a recording schedule and decide what events triggers the recordings. Certainly works for snapshots, – but I assume it handles video also. Unfortunately not much help in the manual. PS: My camera was preset to use Port 81, n0t 8888. Dan, I have a problem you might be able to help with. I have a static ip address for the camera (via No-IP.com) and have port-forwarded the traffic to the camera. If I use the No-IP url to access the camera from my own PC it looks fine, but when other people (outside my network) access it they tell me that there is a lot of flicker. I can’t find anything to explain this. (I assume that my connection is really routed out of my network and back again). Do you have any idea what the problem is ? When you access from inside your network using your No-IP.com domain name, your router is clever enough to realise that you’re connecting to the same IP address that it has, and all of the traffic stays within your home network. It’s almost the same as accessing the camera directly via its own internal IP address. When someone outside your network access the camera, the video stream is sent to them via your router. Most residential broadband services have only a limited bandwidth for uploading to the internet. For example, my connection here will allow me to get data from the internet at 16000 Kbps but I can only send data to the internet at 800 Kbps, which is just 5% of the incoming speed! I suspect your situation is similar, and it’s the reduced upload bandwidth that is causing the flicker in the streaming video. Reducing the resolution is really the only way to reduce the amount of data the camera sends, and might help with flicker but at the cost of image quality. Depending on your budget, and what is available in your area you might be able to get a different upload rate from your ISP. For example, if I put my hand in my pocket and found an extra £12.50 each month, I could change my 800 Kbps upload speed into more than 10000 Kbps. I have solved the problem by switching the Mode to 60hz (was 50) and also reducing the frame rate to 5 (from 25) – so it could be either but I suspect it’s the 60hz change. More tests will reveal which. I don’t think bandwidth is the problem, I’ve just done a test and I can download at 85Mb/sec and upload at 18 Mb/sec (Sheffield, BT Infinity). I try to setup camera to send picture my email address. I try “every” possible settings smtp , port, ssl, none ssl, sender address ect, but everytime when i try test emailserver connection, ansver is same”cant connect to server”. Same email settings work fine in my emailprogram,but not in this camera. Do you know is there some problem this email notification properties? I Forgot say, problem is not my router, port range forwarding should be OK. I have never used the email notification in the camera, so I don’t know if it actually works or not. Port 25 used to be for sending emails, but many ISPs only allow relaying on that port now, so you might find that port 25 is blocked by your provider. The most likely port to work is number 587 as this is the current standard port for sending mail over SMTP. Try first without TLS. Make sure the “sender’s email” is the email address of the account that you send from. The “Receiver 1” (and 2,3,4) are where you put the email addresses of the people who should receive the email alert. You might run in to problems if the sender and receiver are the same. If that doesn’t work, try ticking the ‘needs authentication’ box and use the username and password of your email account. If it still doesn’t work, try again with TLS without authentication. The finally try TLS with authentication. Hopefully some combination will work. Good luck! I´ve a time now the Lidl camera and innend to connect it with ISpy but ISpy dosn´t work with it. Did you have an idea where the error could be ? The camera is manufactured by Kompernass. Perhaps this info might help? I have this camera and it worked fine but I unplugged it for awhile. I tried to set it up again but its telling me Incorrect username or password which I have forgotten, is there any way to just reset and start agin. There’s a reset button underneath the camera that should clear all the settings. The default username is “admin” and the password is left blank. I’m a Mac user and I haven’t had much luck with this camera. I’m able to connect via iuk app on Android fine, but I’m unable to connect via web. I’m using the camera in a nightclub. I have a number of CPUs, machines, security cams, etc connected so I’m having trouble identifying the iuk IP address. Would have a solution for this?? Are there any mac based apps that you’d recommend? I’m not a Mac user, so I can’t help with specific apps. You can view the stream in a web browser though. Hopefully you’ll discover the ip address of the camera in the list that shows up. I’m not sure what’s happening there. If you’ve pressed the reset button (with power applied) it should have gone back to username “admin” and a blank password. If you’re accessing from a web browser, try clearing the browser’s cache. If you’re using the mobile app, try uninstalling it and reinstalling it. I can’t access my camera when out of my home or using other wifi or 4g I also don’t understand how to access my router setting or do port forwarding. I would like to access the camera when I’m not home but i can only do it when I am home and using my own wifi. The camera also won’t work wireless I have used the cable set up the wifi on the settings and then when I unplug the cable to let it be wireless it does not work either. It’s so long since I used my camera, I can’t remember which ports you need to open, sorry! You could try putting it into the ‘DMZ’ of your router, which effectively opens every port. The camera software isn’t really strong enough to cope with modern hacking tools though, and it’s likely to get hacked in time. I wouldn’t recommend using this model of camera on the internet these days. The software in the camera isn’t the best. It’s not too difficult for a hacker to access it without actually knowing your passwords! It sounds like your camera could have been hacked. You could try resetting it using the button underneath but bear in mind that the firmware might actually have been changed by a hacker so it might still be a risk even after a reset. Once a hacker has used the camera to get onto your network, they could potentially hop off from there to other devices, so it’s worth being vigilant to any other oddities from your other pieces of kit! I wouldn’t recommend anyone uses these cameras on the open internet anymore. They’re not really up to withstanding today’s hacking tools. I hope you don’t mind being asked for advice after all this time ?! I have been using my Lidls camera for a few years now on IUK Viewer. However, it doesn’t take photos on movement detection or record video. I’ve been looking into other apps I can use on my android only & am struggling to find one that doesn’t need setting up via a PC. Can you recommend any good ones, in your experience. I have tried I Spy (but needs windows?) and Ivideon which doesn’t list the make (Komperness – or whatever you said earlier!). Any ideas would be gratefully received. I’m afraid I’ve not used my camera for a year or so now, which means I’ve forgotten all the intricate details! It might be possible to use the live stream from the camera, which some software packages should be able to read, but in order to do any kind of movement detection or recording you’d need to have the app running all the time. That might give you a starting point. Good luck! Hi, If you could help? I bought a used one of these cameras on eBay but it is not working. I have plugged it in, there is a constant orange light near the Ethernet port but nothing else seems to be working on the camera. In the manual it stated it will do a rotation test but this did not work. The app states it is offline and the web browser will not display it with the ip allocated from the DHCP on the router. If you know of this issue I would appreciate the help. Many thanks. If it’s managing to get an IP address from the router using DHCP, then some of it must still be alive. The only thing I can suggest is that you do a reset using the small button on the base. I can’t remember what the default username and password is though, but if does a rotation test after that you should be back in business. Good luck! I somehow got this camera to work without installing the CD as my laptop does not have a cd drive. I’ve recently pulled the camera out after not using it for a couple of years and have no idea how to set it up again. In the manual it says to insert the CD into a drive I do not have. Are there drivers I can download? Hi, If you could help? I bought a used one of these cameras on eBay but it is not working. I have plugged it in, there is a constant orange light near the Ethernet port but nothing else seems to be working on the camera. In the manual it stated it will do a rotation test but this did not work. The app states it is offline and the web browser will not display it with the ip allocated from the DHCP on the router. If you know of this issue I would appreciate the help.ive pressed reset button for 20 seconds but it dont do a rotation test can you help Many thanks. after the reset (with the small button) it should go back to its original user and password. User = admin, password should be left blank.